Educational Requirements: 1.Graduate in Arts/Science/Commerce or any other Discipline or any other higher qualification with 50% marks. 2.B.Lib.Sc./B.L.I.Sc. with 50% marks 3.Course in computer application at Graduate or PG level or 6 months Computer course from a recognized institution. 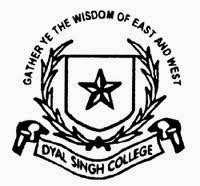 How To Apply: Applications strictly in prescribed format, complete in all respect, together with requisite certificates and testimonials must reach the Principal Dyal Singh College, Lodi Road, New Delhi-3 on or before 14th Feb.2014.